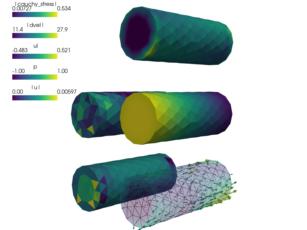 Biot problem - deformable porous medium with the no-penetration boundary condition on a boundary region enforced using Lagrange multipliers. The non-penetration condition is enforced weakly using the Lagrange multiplier . There is also a rigid body movement constraint imposed on the region using the linear combination boundary conditions. condition on a boundary region enforced using Lagrange multipliers.